jamoni wrote: They had a 30m receiver and a 20m transmitter, too. I chose the 6m receiver because I already have an HF rig that covers 10-180m, and some VHF/UHF gear. So 6m is about the only band I don't have covered. Yes, I think that the only band which sees less use than 6 meter is the 220 mhz band (1.7 meter or some such?) but it is good for mid range vhf. Anybody else in St. Louis using 6 meter ? Well, the Missouri ARES guys are putting together a 2m/6m packet repeater network, which so far spans the state from Kansas City to St. Louis, along the Missouri River. There's plans to extend it north and south from there. I don't really need the 6m element of it, since I'm right on top of most of the 2m repeaters in ST. Louis, but it's evidence that the band is useful in these parts. jamoni wrote: Well, the Missouri ARES guys are putting together a 2m/6m packet repeater network, which so far spans the state from Kansas City to St. Louis, along the Missouri River. There's plans to extend it north and south from there. I don't really need the 6m element of it, since I'm right on top of most of the 2m repeaters in ST. Louis, but it's evidence that the band is useful in these parts. I am all for seeing more use of 6 meters. Can you tell me if there is anything on the web about this? I'd be interested in knowing more. The MERSWEB page had some info on it, but it looks like the site is screwed up. I'll see if I can find some more info. Well, I just found out the hard way that my Yaesu FT2500M can take at least 30 seconds of key-down with no feed line attached, and not burn out the finals. Luckily it was set to low power. jamoni wrote: Well, I just found out the hard way that my Yaesu FT2500M can take at least 30 seconds of key-down with no feed line attached, and not burn out the finals. Oh dude, that is not a cool test! Don't let the magic smoke get out, it won't work then! It came through ok then? Yeah, it's fine. I just used it for the ZS net. I have a feeling that if I'd been pushing the full 50 watts I'd be in the market for a new radio right about now. Doctor Jest wrote a great post about what types of gear is out there, but I'd love to hear some more details from those of you who are experienced. Specific equipment recommendations are welcome, but I'm trying to get an idea of the general direction you have taken with your equipment purchases and the all-important "why." What features in your radios are your "must haves", "nice to haves", and "do not want"... and why? Specific features of interest: Crossband Repeat, Digital Voice and/or data, APRS, Multi-band, Wideband RX/FM broadcast/AM broadcast, etc. Given your experience, and assuming a HAM has at least a general license, what would be your recommended "order of acquisition" of equipment, and why. For example, Mobile VHF/UHF -> Base HF -> Handheld VHF/UHF -> Mobile HF -> etc. If you have multiple radio types (VHF/UHF/HF, Base/Mobile/HH, etc), which is your favorite and why? I know this'd be a lot of work, but I'd love to hear y'all chime in. I've tried to search for this on eham.net, but it's the biggest flamefest this side of arfcom general chat, and qrz.com hasn't "done it" for me. Edited: eham is the flamefest, not qrz. My bad. Last edited by Leethal on Thu Nov 20, 2008 7:55 am, edited 2 times in total. Jvandenhaus wrote: This is why we can't have nice things. Neal Boortz wrote: "Robin Hood didn't, as most people believe, 'take from the rich to give to the poor.' He actually took from the government. Small but important point." Oh my, you've asked a broad question! Which kind of radio and why (which you seem to be asking) is like which kind of firearm and why. But let me take a stab at it. 4) It works in the most commonly used segment of the HAM bands in North America. You really, really, really want your HT to cover both the 70cm and 2 meter bands. Now-a-days that comes in a single radio as a matter of course (not as expensive as it used to be). Or you can start out with two radios, one on each band. You also want to have an HT that is rugged and weather resistant. once you have that under your belt, you'll want more power/range (although you'll be surprised what you can do with an HT using the right antenna and placement). That's when you step up to the mobile VHF/UHF unit. They commonly run at 50 watts output (or about 10 times what your HT does) and is easier to operate when you are in you ZPAW crew wagon. Once again, great for mid-range tactical comms and uses the most common frequencies. HF can be used to good affect for mobile tactical communications, but it takes a lot of work to set it up. To give you an idea, using a 2 meter mobile, FM voice mode at 50 watts simplex (no repeaters), you will get (if everything is good) LOS (line of sight) to the horizon, from the height of your antenna (50 miles?). Using HF SSB at about 80 meters and a mobile NVIS (Near Vertical Incidence Skywayve) antenna, you will have solid coverage out to 4 or 5 hundred miles easy and skip zone after that. So the answer is what kind of communications do you want, then that tells you what kind of radio you need. As far as modes, the minimum is voice mode in FM for VHF/UHF and SSB for HF. The digital modes are great and there are a lot of cool things you can do with them, but in the PAW, Voice is King. Leethal wrote: Doctor Jest wrote a great post about what types of gear is out there, but I'd love to hear some more details from those of you who are experienced. Specific equipment recommendations are welcome, but I'm trying to get an idea of the general direction you have taken with your equipment purchases and the all-important "why." I know this'd be a lot of work, but I'd love to hear y'all chime in. I've tried to search for this on QRZ.com, but it's the biggest flamefest this side of arfcom general chat, and eham.net hasn't "done it" for me. Yep, it was an intentionally broad question, because I'm really looking for general ideas based on the experience of prior hams. To use the firearm question as an example... "I'd recommend a .308 or larger bolt action rifle, because I hunt deer here on the high plains, you aren't going to get any shots at less than 100 to 150 meters and buck shot just ain't gonna cut it." Conversely, I expect another person to chime in with, "I use a .30-30 because here in the words of LA--that's Lower Alabama--all of your shots will be at 100 meters or less, and generally less than 50." This will help folks looking for info "pick and choose" the suggestions that best match their general situation and needs. I was going to create a series of posts soliciting opinions on various subjects, but figured I'd just ask y'all to write an essay instead. Thanks, bngad. Do you have any opinions on cross-band repeat. Is it worth the extra cost? I've never used crossband repeat (other than standard networked repeaters) so I cannot shed much light on it. I mean in concept, it is a great idea. Say you had to do some remote SAR, you could park you rig on a hill, set up you crossband and use your HT to get back to the truck, and let the truck send you signal back to the base. But, I've never worked with it, so I cannot really give you an opinion. Leethal wrote: Yep, it was an intentionally broad question, because I'm really looking for general ideas based on the experience of prior hams. To use the firearm question as an example... "I'd recommend a .308 or larger bolt action rifle, because I hunt deer here on the high plains, you aren't going to get any shots at less than 100 to 150 meters and buck shot just ain't gonna cut it." Conversely, I expect another person to chime in with, "I use a .30-30 because here in the words of LA--that's Lower Alabama--all of your shots will be at 100 meters or less, and generally less than 50." This will help folks looking for info "pick and choose" the suggestions that best match their general situation and needs. I was going to create a series of posts soliciting opinions on various subjects, but figured I'd just ask y'all to write an essay instead. My must-haves in terms of radio break down into their installation. One common feature that I feel is required across all VHF/UHF equipment is a DTMF pad. This is used to access "fun" features on repeaters such as IRLP and Auto-patch. Cross-band repeating is quite handy if you have an HT and you know your 5 watts from said HT will get you spotty repeater hits. APRS is a lot of fun to play with. If you're looking to get into weather spotting and or want to fuss around with an entry-level digital mode, it works quite well. Digital Voice would be fun to play with, but it's penetration into the market is bleak at best. Most radios that have wide front ends will allow you to pick up the weather frequencies (they're around 162mhz I believe...). In terms of progression, I'd do something like this: Base VHF/UHF (mobile + power supply) > HT VHF/UHF > Mobile VHF/UHF installation > Base HF (potentially a mobile rig w/ power supply) > Mobile HF. Last edited by PoorImpulseControl on Mon Dec 01, 2008 4:37 pm, edited 1 time in total. Living up to my username since 1980. Thanks, PoorImpulseControl. Keep 'em coming, Elmers. To the specific gear question. I have a lot of portable equipment. The best portable stuff I have is an Icom 706 Mark II G. This radio is all mode (CW, SSB, AM, FM, and digital) for the 70cm, 2 meter, and all of the HF bands. I have an LDG autotuner (for matching any antenna to the HF bands, and a Kenwood V71 A (for FM 2 meter and 70 cm). For the antenna I have a Tarheel Screwdriver and a random wire with a 4:1 balun for HF. Now for the vhf/uhf side antenna wise I have a vhf/uhf mag mount from MFJ and a vhf/uhf halo for vhf/uhf horizontal polarization (ssb and cw). I have a MFJ mightylight 25 amp power supply (or the station can run on a car battery). Now to the reasons I have those. The 706 is one radio that covers everything and it is small. It has a good size screen also. The competition for it is the Yaesu 857 D, but it has a smaller screen and is a lot more menu driven. The two antennas that I have for HF are easy to put up and can litterly be thrown up when you need them. The LDG autotuner matches the random wire so I can put it up anywhere in any configuration. Now for the Kenwood V71 A. It is 50 watts vhf and uhf. It has crossband repeat which I love. This enables you to put the V71a in your vehicle and use the antenna on your vehicle to acess the repeaters or other simplex stations and use your Handi Talkie at 5 watts or less while you stay in range of your vehicle (not repeater) . The V71 a also has some other cool features like dual watch ( 2 sides to the radio, means you can monitor two frequencies at once). The V 71 A also has an autodial in case you live close to a echolink enabled repeater and makes dialing another repeater easy. As to the question about GMRS/CB repeaters into the Ham stuff, that is NOT allowed. The rule says "it shall be illegal to crossband radio services". In other words you can cross band in the Ham service, but not from ham to c.b. or from c.b. to ham. Now, someone can monitor c.b. and litterly "say" what they heard, but not let the c.b. go directly over Ham frequencies. I know that I exist because I am always here, however you are sometimes not here, so I am not sure if you exist. Mississippi wrote: To the specific gear question. The best portable stuff I have is an Icom 706 Mark II G. This radio is all mode (CW, SSB, AM, FM, and digital) for the 70cm, 2 meter, and all of the HF bands. I love my IC-706MKIIG That said, I am replacing it as my base rig with the Yaesu FT-767GX, so that the IC-706MKIIG can go mobile. 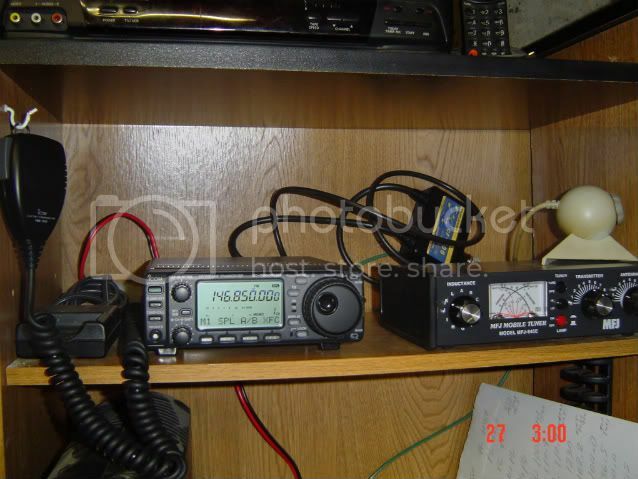 The Yaesu FT-767GX will take up that whole shelf by itself. But, the Yaesu has built in power supply and built in automatic antenna tuner. Favorite Zombie Movies: fido, shaun of the dead, 28 days, i am legend, probably others that I cant remember now. In the US, under a FCC license, tech class people are allowed to do SSB phone (voice) on part of the 10m band (28.300-28.500 200w PEP iirc). They are somewhat limited compared to general and above, but this can get a lot more range, and a 10m SSB transmitter has the potential of intercontinental communications providing the other country has an agreement with the US. For example its not legal for a tech to talk to anyone from CH (Switzerland) when a radio is involved. Even though its legal for you to talk, and them to talk, its not legal for the two of you to talk together because CH/US have not entered into an agreement that allows that. This includes if echolink or anything else is involved (which echolink/irlp/etc would be a bad idea to practice on for disaster response since the intarweb may not be there in a disaster). If the sun starts to behave and gives us some sun spots (tomorrow is supposed to be one!) then 200w at 10m is more than enough to talk to Europe from many US locations if you have a suitable antenna (which is a whole different discussion). With a solar peak you can probably do that with as little as 10w. In an emergency the FCC waives all rules if the operator believes that transmitting on that mode, with that power, and that modulation will bring assistance to save life or property. Other countries may still refuse to honor that, but usually bone fide emergencies are exempt from that globally - check with your local laws though. trixter wrote: If the sun starts to behave and gives us some sun spots (tomorrow is supposed to be one!) then 200w at 10m is more than enough to talk to Europe from many US locations if you have a suitable antenna (which is a whole different discussion). With a solar peak you can probably do that with as little as 10w. Aye. I've been waiting with baited breath, and checking solarcycle24.com every so often. The one that's coming around certainly looks like a doosey! Supposed to be a beta-class! YAY! Personally, I've current got a Yeasu FT-817ND and a Buddistick (http://www.buddipole.com). I also have an HF Packer Amp (http://www.hfprojectsyahoo.com/hfpackeramp.html), and I'm going to buy an Antenna Analyzer (probably an MFJ-259B) to help with antenna set up. My primary goal is to get starting doing Summits-on-the-Air (http://www.sota.org.uk/), which is where you pack up a hill or mountain, set up a portable station, and communicate with folks elsewhere. However, I think it's a pretty handy package for an emergency situation. I like the FT-817ND because it is self-contained... it has an internal battery, and it's fairly lightweight. I haven't weighed the whole kit yet, but the whole thing is lighter than the first radio I looked at (FT-897D). It is a QRP rig, limited to 5 watts (25-30 with the amp). But the internal battery was a big issue for me. I think an FT-857D with an external battery is a good full-power option. I think the A123 battery technology seems very promising in terms of weight/capacity, but I haven't used it myself. I think there are a lot of great alternatives, but the all-band/all-mode nature of the FT-817/857/897 series combined with the internal battery options of the FT-817 and FT-897 were the deciding factor for me. If was wasn't hopelessly inept at code, the Elecraft KX1 (http://www.elecraft.com/" onclick="window.open(this.href);return false;) is smaller and lighter, but it doesn't do nearly as many bands or modes. It's still a neat rig, however. I think I need some nice solar panels and a charge controller to recharge batteries, but I haven't really researched that yet. It seems that most of you have found radios without much trouble, could someone give me the link to a cheap radio that will work well? What I would recommend is trying to buy a used radio. There are a lot of older hams who are passing away these days, and a lot of excellent used equipment around as a result. First of all, try ebay. There are also ebay-like web sites that specialize in ham equipment - take a look at the classifieds section of eham.net, for example. I would very strongly recommend getting in contact with a local ham club. I have gotten several radios through people I've met there. A ham will sometimes buy a fancy new radio and be willing to sell his older radio cheap, especially to a young ham just starting out, and can give you tips on how best to use it. I got my current radio, a state-of-the-art Icom, brand new, for $100 below retail - the ham I got it from won it at a hamfest, didn't need it, really liked his current radio, so he sold it to me. Quick question. How does one burn a radio out? I am about to get my first one and I don't want to make that mistake with a $1000 radio. The quick answer is transmitting with no antenna attached is about as bad a thing as you can do to a radio. Essentially you are putting power out to the antenna connection and it has no place to go because it has nothing to radiate it outward. So instead it is put out as heat within the transistors in the final amplifier stage of the radio, and they cannot take too much heat. These transistors are not cheap to replace either. Many modern radios can measure SWR, the standing wave ratio, which is a measurement of how much RF energy is coming back into the radio. A ratio of 1:1 is a perfect match between the radio and the antenna, 1.2:1 is about as good as it gets in practical terms, and anything over 2:1 is typically considered bad. This high SWR can be the result of no antenna or an antenna that is not matched to the frequency you are trying to use it on. These modern radios will reduce their transmitting power automatically when they detect high SWR to keep themselves from burning out. A good insurance policy, but nothing you want to rely on. Yeah. When testing a radio to see if it is operating properly, you connect the radio to a "dummy load," a large resistance that dissipates the radio energy as heat but prevents it from being reflected back into the radio. Transmitting without a dummy load will fry an older radio, but, as has been noted, a newer radio will power-down to prevent such damage.